Dropbox is one of the most highly acclaimed names in the cloud storage industry. The focus on a simple service and this coupled with incredible storage plans makes their service incredibly popular. Not to mention the fact they have universal experience on desktop, mobile and web interfaces; this means they provide a service you know you can rely on. 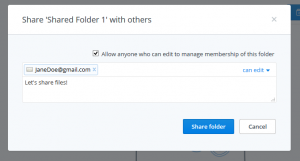 Dropbox’s service is truly incredible and makes backing up and the sharing or transferring of files online incredibly simple, this is because they implement a simple drag and click system. 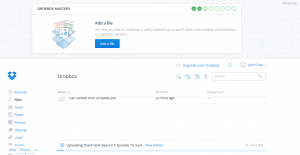 Dropbox features a vast array of different features that they provide with their service, these include numerous options for backing up your data online. You can easily backup in a variety of methods using their mac/pc app and web portal, they even provide a mobile application for iOS/Android. 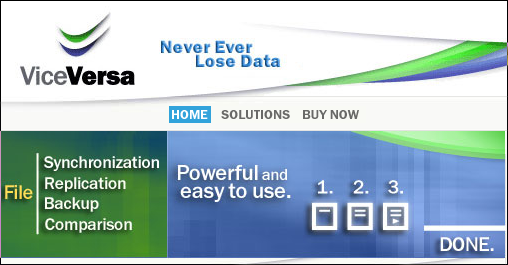 Their service supports all types of formats such as videos, documents, pictures and more. They also allow you to back up all your important files, their easy to use interface makes it simple and fast to do this. 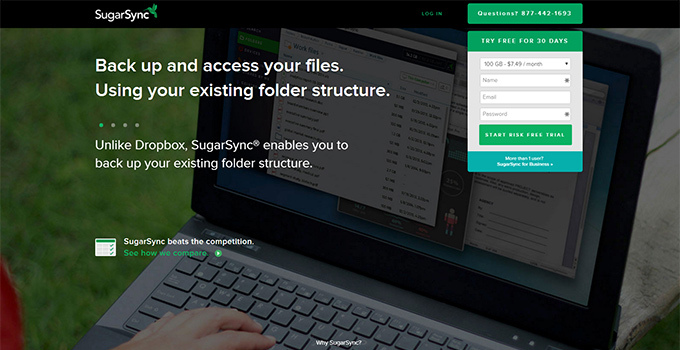 All you have to do is drag, drop and sync, from there the service provided allows you to do things like share out files with a simple right click. Dropbox gives users complete control over their files and they allow you to see information like modification dates and who has access to certain files. Whilst at the same time the service they provide maintains a high level of security and privacy throughout. Dropbox offer three plans to their users; they offer a completely free plan, a pro plan and lastly a business plan. The first plan they offer with their service is a free Dropbox account, this plan includes most of their basic features such as sync, mobile support, and security. The Pro account costs $9/monthly and includes features such as 1TB of data storage, password protection on files, higher share limits and more. 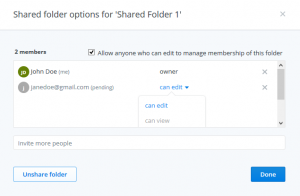 Lastly Dropbox for Business gives a bit more security and sharing options and is deigned more for enterprises, this plan focuses more on users who’ll be sharing files throughout a company and is priced at $15/monthly. The security provided with Dropbox includes a 256 bit encryption and SSL on transfers. The great thing about Dropbox is that a 2-step verification process is available for your account adding another layer of security. Public files are also only viewable by people who you permit, there is also 3rd party app permission and you can wipe devices that may be lost (remotely). Another security feature is the fact you can set expiration links on files. All of these security features means that you can ensure your files are all taken care of and that only those you have chosen can view or edit them. Any transfer you make is made securely and high levels of encryption ensures your files sync directly into Dropbox servers. Dropbox isn’t known for imposing any unreasonable bandwidth limitations, throttling, or other annoying features on their file transfers. Their file transfer speeds are adequate because they don’t have a local encryption feature, though they aren’t lightning fast. To understand the results, you should have an accurate understanding of my Internet connection. I’m using an ADSL Internet connection with 5Mbps download and only 1 Mbps upload, which isn’t too fast by today’s standards. If you have a faster upload rate, your transfers will likely be faster. I tested with a 135MB file, and it took 17 minutes and 10 seconds for the transfer to complete. Some users have complained of extremely slow speeds on online forums, but their problems could be due to a variety of factors including misconfigurations, shared Internet connections, ISP issues, etc. All in all, their speed is more than adequate, and users will have better results with faster Internet connections. Dropbox supports most file types whether its video files, documents, photos and so on. As long as your storage supports the file capacity Dropbox can sync the files into their servers. Backups can even be made automatically with their desktop folders or mobile app. iOS/Android have the capability to sync camera roll pictures/videos automatically into your Dropbox, this means that all of your precious memories are secured as soon as you capture them. On the other side of things Dropbox also provides an excellent services, their service allows you to restore data as you need to. 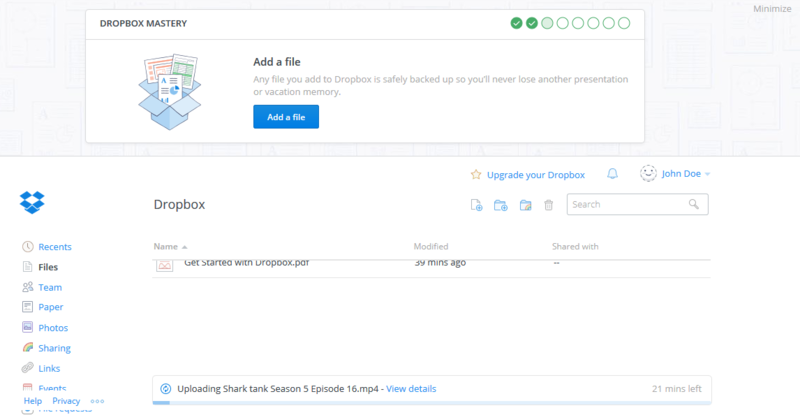 You can easily view previous backups of files or things that you may have removed from Dropbox. Being able to view previous backups makes it easier to recover files that you may have been backed up and accidentally deleted. The service they provide also automatically keeps the last 30-days of media that have been synced. This means that Dropbox has you covered and saves your data, which can help you when it matters most. The great thing about Dropbox’s vast user base is the support team that comes along with it. They provide a vast help centers that focuses on some of the most common issues you may encounter. If that doesn’t provide you with the information you need, Dropbox also has a great team that you can contact if you have any issues with them. The higher plans they provide such as the pro or business also come with priority support, this priority support comes in handy when something critical happens to your Dropbox account. Overall the support service they provide proves more than adequate, it allows you to easily to get in touch whenever something happens that you need support for. 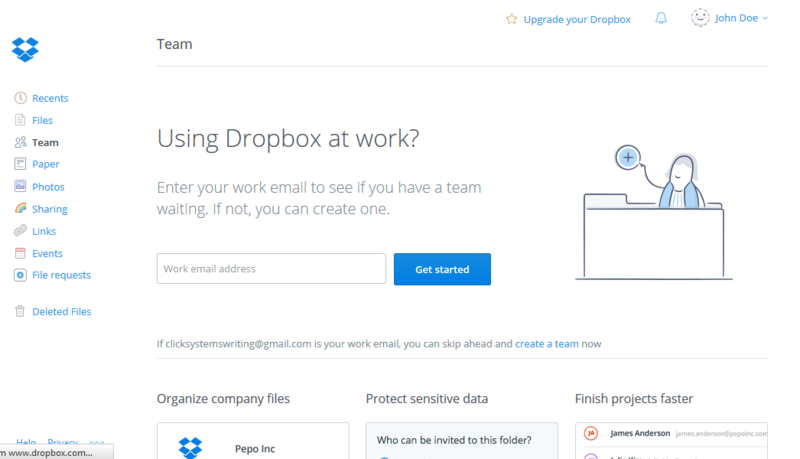 Overall Dropbox is one of the top cloud storage services for a reason. It focuses on simplicity and speed in its syncing process. They also provide incredibly simple plans that provide you with more than enough storage to store your files your files. There pro and business plans are also priced incredibly competitively and the free plan offers a nice amount of storage for a free plan. The service they provide is packed with great features such as unique security methods like private link sharing, expiration links and file restoration. More importantly Dropbox is a universal service that allows you to sync via the web, a desktop app, or mobile application. Your files are accessible everywhere and anywhere you go and that’s the best part of Dropbox. Get started today and back up your data into the cloud fast and incredibly efficiently with Dropbox.